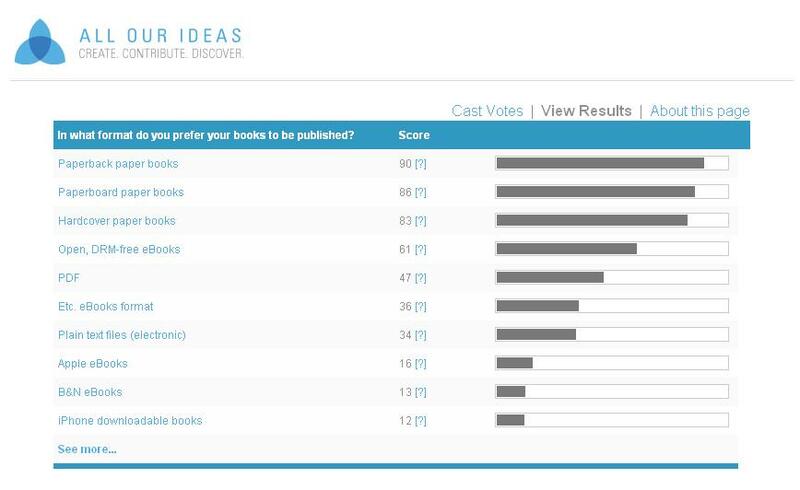 Preferred book format survey results. – Condalmo. Preferred book format survey results. A couple of weeks ago, I put together a survey to get a sense of how people want their books – paper, hardcover, e-book, etc. Some people (my wife) hated the survey, as it assumed knowledge of various e-book formats and probably skewed the voting as a result. (If someone came to a question about two formats unknown to them, they probably just closed the window.) This may be true; I only earned a B in Psychological Measurement class, so this isn’t the most rigorous experiment you’re likely to see. Anyway, the results. Click here to see more about how it all broke down. Previous PostPrevious Where do you look to learn about new books? Next PostNext Random “Cloud Atlas” question.